Do any of you remember what the Music Industry Looked Like on September 11, 2001? It’s only been 10 years, but the music world has made so many changes… can you remember? The following is a list of some of the changes in the last decade. There were 5 major labels: Warner Music Group, EMI, Sony Music Entertainment, Bertelsmann Music Group (BMG), and Universal Music Group. 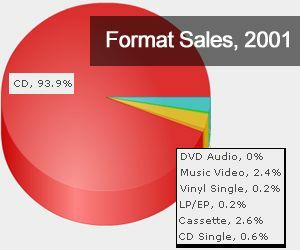 CDs accounted for 94.5 percent of overall recorded music sales, according to the RIAA. Cassettes still accounted for roughly 2.5 percent of the total, LPs were roughly 0.2 percent, and album downloads were essentially nonexistent. The labels were on their way to concluding their third-best year ever (the best being 1999). The iPod was still two months from being announced. The iTunes Music Store was still about 20 months away. Mariah Carey’s Glitter Soundtrack was released on September 11th. The movie arrived at theaters a few weeks later. The song with the most spins on radio on September 11th was “I’m Real,” by Jennifer Lopez. The top-charting country single was “I’m Just Talkin’ About Tonight” by Toby Keith. Justin Bieber was 7 years old. Justin Timberlake was 20. The best-selling album on September 11th was the self-titled release from Aaliyah. The singer had recently passed on August 25th, 2001. Janet Jackson, Sade, Aerosmith, and Dave Matthews Band were dominating the live circuit. U2 was preparing the North American leg of its Elevation tour, and actually planned the official announcement on September 11th. When I see this list it makes me think that the technology of music has changed so much more than the artists. All the mentioned artists except for Aaliyah, are still performing today. However, the changes in the way we listen to music and the changes in the business of music are enormous. It certainly makes you wonder what changes we will write about in another 10 years. Thank you to Digital Music News for the list! Please don’t forget to add your holiday song suggestions on September 9ths article. The more responses, the more fun!! Holiday music and Clay Aiken is the best partnership around. Will you be attending the Gala in December? It's amazing how fast things have completely changed. That's a fascinating article. Thanks for a great blog. Well, time certainly does march on. Actually, I had almost no knowledge as to the state of the music industry ten years ago. But, I was aware that CD's were the accepted mode of selling music to the world's population. I rarely listened to the noise coming from the radio's music stations and had no interest in purchasing those CD's. Two years later, along came Clay Aiken and I was back in again. Too bad the higher ups at the radio stations decreed that they would no longer play Clay's songs. The CD players, i pods and all the other newest listening gadgets are effective substitutes for now. Do not know what the music industry's future holds – but I do know I am not going to be listening to any radio station's noise pollution, nor buying any auto-tuned music. musicfan – Thanks for another interesting music article. You definitely know how to gather a wealth of information. I saw that the GLSEN awards will be presented on Oct 21 in CA. Do you suppose that is where Clay will be acting as a presenter, perhaps?! Wherever he will be appearing, I hope it will be on a TV channel that I receive. In Clay's e-mail, he said it was something on Network TV. I have read the GLSEN homepage and three other articles and there is no mention of the awards being on network TV. Yes I'm attending the Gala in Dec. I will be there. It is so exciting that we will hear Christmas songs. It's been quite a while since I last saw Clay sing Christmas songs. One of my favorite concerts was the Christmas play in 2005. I brought three friend who had never seen Clay in concert. They absolutely loved it so we all went to his 2006 Christmas concert and brought several other newbies. Last December I ran into one of them, a thirty year old mom, and she asked me to make sure and call her for another Clay Christmas show. Unfortunately that was the last one in our area. I'm really hoping for one in 2012. Maybe Clay will be trying out songs for another Christmas cd. Error: Error validating access token: Session has expired on Tuesday, 21-Aug-18 16:13:01 PDT. The current time is Saturday, 20-Apr-19 02:16:31 PDT.